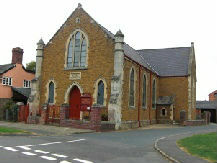 The Methodist Chapel was built in 1881 following the Wesley revival and remains a focal point of Village affairs. Prior to 1881 services were held in the adjacent property (formerly the Post Office). Enthusiastic Methodists raised the money to build the spacious and attractive edifice we now see. There is a strong bond of unity between Church and Chapel worshippers. Cropredy Methodist Chapel hold a BIBLE FELLOWSHIP, to which ALL ARE WELCOME. We meet on a Wednesday at 2.15 in the Chapel. We finish at about 4.30 after tea and biscuits. This is a wonderful opportunity if you are looking for answers to questions. Maybe we can help. If we don't have the answer, we know someone who does.